The world of cash automation has remained stagnant for quite some time. Many of the same products have remained on the market with the same capabilities- until now. Nautilus Hyosung has introduced two new cash recyclers over the last couple years with the most recent one being the MoniSafe 500. 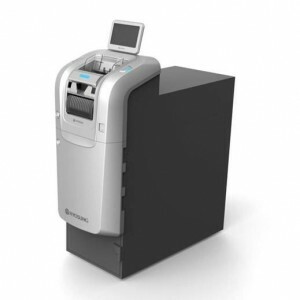 The MoniSafe 500 offers several unique features to the market that allow tellers to be even more efficient with a cash recycler. With the external transit cassette, tellers can load and remove cash from the recycler without opening the safe. This allows for more secure transfer of cash throughout the branch by reducing cash exposure. The external transit cassette also allows cash to be loaded from one Hyosung cash recycler to another, a Hyosung self service unit, or Hyosung ATM. The MoniSafe 500 and 400A are the only two cash recyclers on the market that are able to do a self audit. With this function the recycler actually audits the contents of the cassettes without anyone opening the safe and removing the cash. Whether you need to do a vault buy or sell, or just complete a teller transaction, the 500 is going to offer the fastest deposit and withdrawal speed on the market. Rated at 12 notes per second, the 500 will get you back to your customer or teller station faster than any other machine. This large cassette can store excess notes of any denomination and then uniquely reload the machine from the overflow cassette without opening the safe.